Do your first time church visitors come back for a second visit? You can’t grow your church if your visitors don’t come back again. Is your church hospitality still running in tip-top shape to welcome and receive new visitors? Are your church hospitality processes flowing smoothly, or is stuff falling through the cracks? I suggest doing an in depth church hospitality evaluation quarterly. If you are launching some big event like a sermon series that is designed to increase the number of first time visitors, you might want to do one a few weeks ahead of time. Back up a few weeks from that Sunday and schedule an evaluation of your church’s hospitality system. You might also choose to do a brief church hospitality review each week as part of your worship planning. One fruit of the review is to discover areas of potential friction (that which makes your visitors feel uneasy, or even your volunteers feel uneasy) and remove it. A regular review will remove some rough edges that might make a visitor feel confused, disoriented, or a little uneasy. 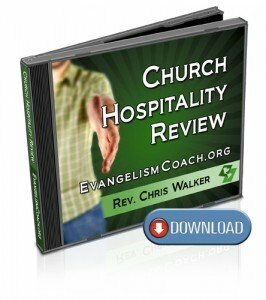 In this 1 hour audio MP3, Chris Walker of EvangelismCoach.org will lead you through the visitor experience of your church. Four variables in hospitality and which ones you can manage. Where to look for unnecessary hindrances to helping first time visitors connect. I’ve recorded a 1 hour long seminar on doing a hospitality review, now available by instant download after purchase. . .
You will have a 5 day window to download your this recording. If the system doesn’t accept your credit card or if you have any questions that have been unanswered, please email me directly and let me know how I can help. I can now take credit card payments over the phone. Call 804-335-1445 during normal business hours, eastern US Time. I’d be interested in getting your feedback. The feedback that you give me, is strictly confidential. Don’t forget to include your telephone number and a time to call you. What will happen once you click the button? You will be taken to a page where you can fill in your credit card or check details. This will be verified instantly and you will be sent to a page where you can download the information right after your credit card has been verified. The download is usually instantly available after purchase is completed. You should be directed to a download page right away. If you get directed to another page by chance, please don’t panic. Computers take breaks sometimes. Send me an email, and I will send you an alternate link and you will be able to download your product without a problem. As with our products, there is a 30 day money back guarantee and no hassle refunds. I’m the only one in customer service and will address your questions promptly when I’m on-line.